I have to ask: when did calm, rational discussion ever do us any good? I agree with Michael Meade, who says that anything worth saying is worth exaggerating. I agree with David Whyte, who says “This is not the age of information. This is the age of loaves and fishes.” May it be the age when the gatekeepers can no longer pull the wool over our eyes, when they can no longer serve up “leaders” charged with the assignment to repair the cracks in the myth of American innocence. May it be the age when the predatory and paranoid imaginations that have ruled our consciousness – and our unconsciousness – for centuries fall away to make room for the creative imagination that still resides in our indigenous minds. I began this long essay by talking about the mythology of the King. As we search for some kind of positive conclusion, bear with me while I stretch out and play with two themes. 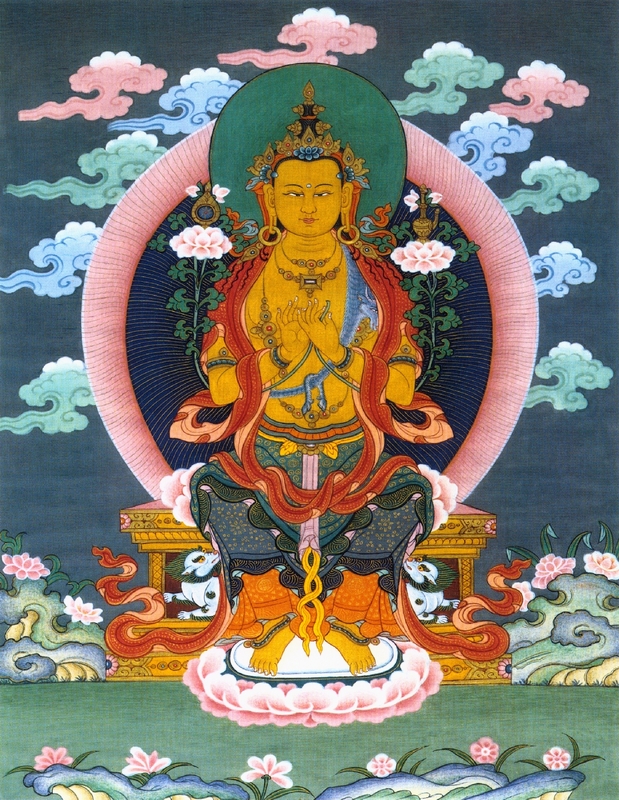 The first is annunciation, the universal, cross-cultural story of how divine messengers appear to predict the arrival on Earth of a great being, such as the Buddha, or Maitreya, the future Buddha. In discussing our idealizations and projections onto figures like Obama – and why we’re still so reluctant to see him as he really was, and why our disillusionment may be so overwhelming when we do – I’ve made reference to another related archetype, the longing for the return of the king, such as Odysseus in Greek myth or the Messiah in Hebrew myth. In Christian myth, the birth of John the Baptist (necessary for the later birth of Jesus) is foretold in Luke 1:5-25. And in Luke 1:26, the Angel Gabriel announces to Mary that she will become his mother. In Mark 1:3, John preaches, Prepare ye the way of the Lord. A second theme is the holy fool, another universal figure who is innocent, unsophisticated, inexperienced and useless. 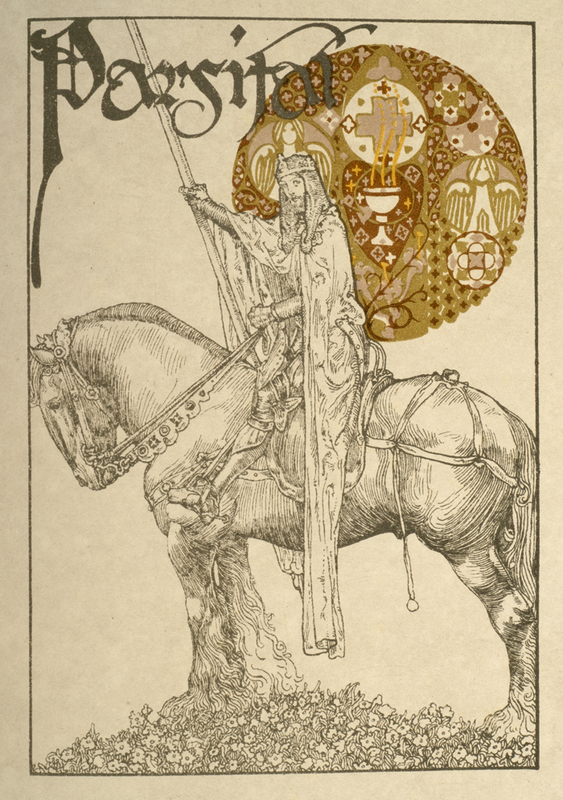 Yet he appears, as Parsifal or as the third, youngest brother in so many fairy tales to complete the task of saving the Kingdom or capturing the Firebird when his two older, heroic brothers fail. He accepts guidance from animal helpers. His intelligence is of the body, and utterly unconscious. But, unlike his brothers, he is “a man of sorrows, acquainted with grief.” (Isaiah 53:3). Bear with me. When we combine these two universal themes – the one who arrives to announce the impending arrival of another (who is still only in potential), yet who is himself utterly unconscious of his actual and necessary role in the drama, who may actually be quite a wounded soul, maybe even embodying the worst in all of us – we find a mythological reframe of Barack Obama. The one in potential, by the way, will be the one who will lift the veils, who will be the enlightened, or self-aware, or no-longer-innocent one within all of us. Perhaps we need a third mythic theme to put it all together. Again, we find it as a universal archetype: the divine being, or witch, seemingly evil, who demands that the hero perform a series of impossible (almost always three) tasks to save his life, or that of the realm. Often that hero (or heroine, such as Psyche, who must obey Aphrodite’s commands) is that same third sibling who gets help from those same animal spirits. The deity or witch who seems to want nothing but to destroy the hero is, at a deeper level, his initiator, who actually wants him to succeed. For an excellent example, consider the Grimms Brothers tale called “The Drummer,” in which a truly hideous hag requires a quite incompetent hero to drain a lake, cut down a forest and stack a massive pile of lumber. But at the end of the story, she is indistinguishable from the princess he marries. 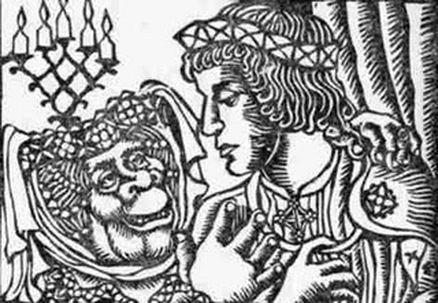 In another incarnation, she is the even more hideous hag, Dame Ragnelle, who forces the Arthurian knight Gawain to answer, at the peril of his life, the question “What is it that women most desire?” Later, after they have married, she gives him the choice to have her beautiful at night, when they are together, or during the day, when they are with others. Instead, he allows her to make the choice herself. This answer lifts the curse for good, and Ragnelle’s beauty returns permanently. Still with me? We’ve arrived at the seventh and final myth, or way to grade Obama – and, for that matter, all the bankers, industrialists, militarists, fear-mongers, idle rich and all of their politician stooges, media lackeys, gatekeepers and mendacious academics who have contributed to so much human suffering in their pursuit of power and influence. We need to use sacred language, in the subjunctive mode: let’s pretend, perhaps, suppose, maybe, make believe, may it be so, what if – and play. This “willing suspension of disbelief” is what Coleridge called “poetic faith.” Then, says Lorca, the artist stops dreaming and begins to desire. If we combine these archetypal themes – annunciation; the longing for the return of the King; the holy fool; and he/she who poses the impossible tasks – we have something I’ll call the Unwitting Savior. Go, someone, this instant, to the place where this prophet prophesies. “Provoke” (from vocare, to call) is marvelously appropriate. At some level Pentheus can choose. He can invoke or evoke his own Dionysian nature, or he can innocently project it outwards, provoking its expression somewhere else. As I have written several times in the course of this essay, myth is not interested in motivation (or in psychological terms, conscious motivation). Myth is concerned with action, with the mythological facts, with what needs to happen in order to bring the story forward, or with what action that will provoke what must follow. – How can we provoke millions of Americans to wake up from their dream of good intentions and exceptionalism? – What can we do to provoke new gaps in the veneer of the myth of innocence so broad that they can never be shored up and re-sealed? How can we make the dam burst? – What can we do to provoke a situation in which conditions become so difficult, so irreparable that the system will respond by producing a fascist strongman – or in mythic terms a Dionysian figure – who will tear the entire system down permanently so that something much better may arise? – How can we best provoke enough people to so completely suspend their belief in conventional political and religious thinking that they begin to remember the old ways of mythological thinking and learn to reframe their sense of who they are and what they are truly capable of accomplishing? – What is needed to prepare the way for the return of the Goddess? Wouldn’t such questions bring us back to where the myth of America itself wants us to go? And who would be speaking now? The hag? The billions of repressed, humiliated and tortured common people who long for peace? Or perhaps the ultimate “grader” herself – the Earth? This entry was posted in Uncategorized and tagged Barrys Blog # 38: Obama and the Myth of Innocence. Bookmark the permalink.